Nabeshima ware was produced at the Okawachiyama kilns run by the Nabeshima clan, the rulers of the domain of Hizen, in northern Kyushu. The best potters and ceramic decorators worked at the kiln, under the strict supervision of the clan officials. Only the overglaze enamel was applied in Arita. The ware was made for exclusive use by the clan officials, and was never exported or commercially traded. Most Nabeshima ware was produced in regular shapes and sizes - plates were usually made in five or seven 'sun' (one 'sun' is approx. one inch) and one 'shaku' (one 'shaku' is approx. one foot) in diameter. The interior design is highly refined and sophisticated, often featuring common objects such as jars, fans and books as well as vegetables, stylised flowers and plants. 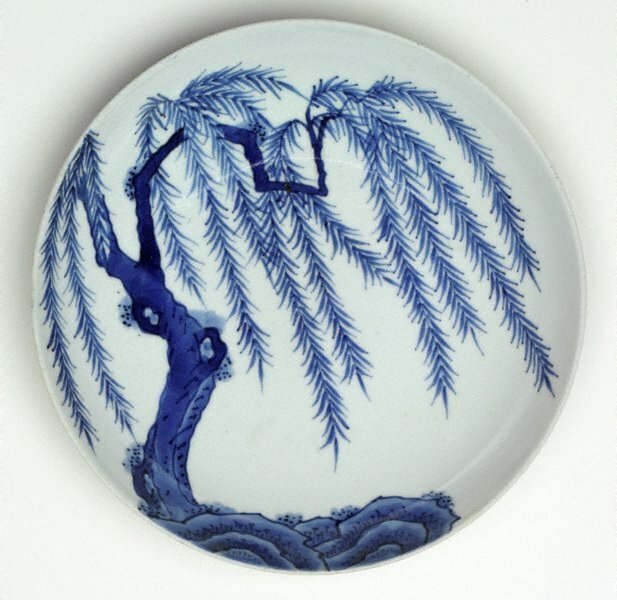 Reflecting the exquisite samurai taste, gold was never used, and even the use of red was limited, while underglaze blue was favoured and used by itself like in this dish or combined with celadon glaze. Asian Art Department, AGNSW, October 2003.